Well, this is exactly why we can’t have nice things. As the second season of Stranger Things thrust its young, talented cast back into the spotlight, its child stars have been subjected to a torrent of disturbing, sexually objectifying comments online. Luckily, one power player in Hollywood is doing his part to put a stop to this gross behavior: To discourage fans from sexualizing the Stranger Things kids, James Corden will no longer have them play Shirtless Baby Oil Twister By Candle Light on his show. Fans of The Late Late Show may be disappointed, but Corden definitely made the right move here. 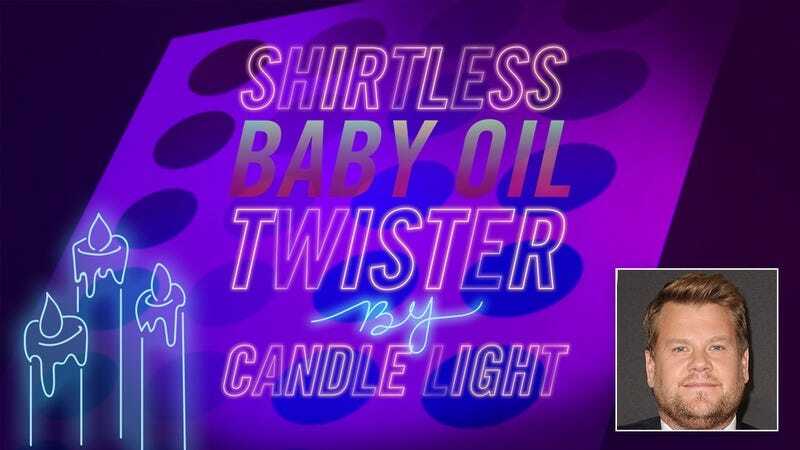 Until recent events, Shirtless Baby Oil Twister By Candle Light was a hit recurring segment of Corden’s late-night program. Each time Finn Wolfhard and all his fellow Stranger Things cast members came on the show as guests, a clip of Corden playing the game with them would unfailingly become a viral sensation the next day. Now, Corden has officially retired the segment, and the healthy YouTube view counts, to avoid encouraging further unsettling sexualization of these underage performers happening on the internet right now. Sad, but ultimately necessary. Although officials from The Late Late Show haven’t confirmed whether they will continue their beloved Apply Lipstick While Blindfolded And Shirtless In A Bed Filled With Rose Petals segment with the boy who plays Young Sheldon, the talk show is clearly doing its part to make Hollywood a safer place for its youngest stars. Even if you don’t watch Corden’s show, you’ve got to applaud him for making this kind of sacrifice to take a principled stance. The cast members of Stranger Things deserve to be having the time of their lives right now, not worrying about creepy fan comments on the internet. In an industry that’s notorious for exploiting child actors, it’s honestly just such a relief that a professional steward of good taste like James Corden has these children’s backs. To Finn, Gaten, Millie, and the whole gang—we have your back, too!! !